Effective January 1, 2019 electricity rates remain unchanged for Regulated Price Plan (RPP) customers. The majority of small business customers are on the RPP. These rates are set by the Ontario Energy Board. Notice to our customers: As of January 1, 2019 the Delivery Charge has changed. 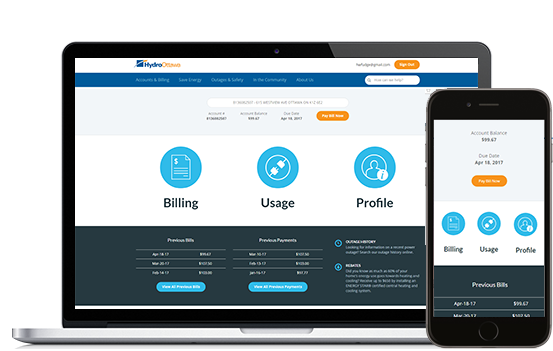 The total monthly bill for a typical small business customer consuming 2,000 kWh per month and having a billing demand of less than 50 kW increased by approximately $2.63 or 0.94% per month, prior to taxes and the 8% Provincial Rebate. Large business, institutional and industrial customers may also qualify for the 8% provincial rebate. Residential rate information can be found here. Download our Small Business Rates Brochure (less than 50 kW demand). Small Business Rates in effect between November 1, 2018 and December 31, 2018. For a list of holidays when off-peak prices are in effect, see our TOU Holiday Schedule. 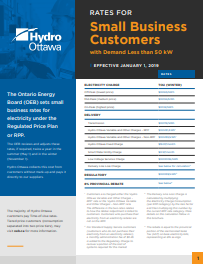 If you are a Tiered price customer, please visit oeb.ca for more information. Small Business Rates in effect between November 1, 2018 and December 31, 2018 are available. 1. The Ontario Energy Board (OEB) sets the residential and small business rates for electricity under Ontario’s Regulated Price Plan or RPP. The OEB reviews and adjusts these rates, if required, twice a year: in the summer (May 1) and in the winter (November 1). 3. For customers who do not purchase their electricity from an electricity retailer, a monthly administration fee of $0.25 is added to the Regulatory Charge to recover a portion of the cost of systems required for the market. Class A customers are charged the Capacity Based Recovery (CBR) based on their peak demand factor (PDF). The CBR is part of the Regulatory line and is a rate of $0.0004/kWh. Class A Customers Regulatory rate without CBR is $0.0035/kWh. 5. Wholesale Market Participants (WMP) purchase electricity through the Independent Electricity System Operator (IESO). As a result, specific rates do not apply to WMP as they settled directly with the IESO. Within Hydro Ottawa Variable and Other Charges, WMP are not charged the Rate Rider for Disposition of Deferral/Variance Accounts - effective until December 31, 2019 – Approved on an Interim Basis applicable only for Non-WMP. The following are the rates by class of Customer within Hydro Ottawa Variable and Other Charges that do not apply to WMP; 50 kW to less than 1,500 kW Billing Demand -$0.4420/kW; 1,500 kW to less than 5,000 kW Billing Demand -$0.4909)/kW; 5,000 kW or more Billing Demand (Large Consumer) -$0.5809/kW. These rates would be subtracted from the rate posted for Hydro Ottawa Variable and Other Charges. Please note for 2019 these rates are in the form of a credit and would therefore increase the rate. 6. The rate rider for the disposition of Global Adjustment is only applicable to non-RPP Class B customers. It is not applicable to WMP customers that transitioned between Class A and Class B during the variance account accumulation period, or to customers that were in Class A for the entire period. Customers who transitioned are to be charged or refunded their share of the variance disposed through customer specific billing adjustments. This rate rider is to be consistently applied for the entire period to the sunset date of the rate rider. In addition, this rate rider is applicable to all new non-RPP Class B customers. Hydro Ottawa Limited Tariff of Rates and Charges effective January 1, 2019.